I will first of all applaud and highly commend all NPP members fearlessly defending the NPP party, government and its policies at all places they find themselves such as markets, churches, communities, and on all traditional and social media platforms, especially the many doing this out of little or no direct motivation or benefit. Your strength being exhibited to match the NDC and all other political opponents of the NPP, and through that helping put the party and government on a scale above prosperity have been splendid. Your loyalty and commitment to the party and government’s progress have been observed and will never go not rewarded. A) It has been estimated that Victims of the MENZGOLD saga have locked up capital running into about 200 million dollars, and we are all aware of how such a situation can get anyone very traumatized. These victims are already emotionally bedridden and so it will certainly not be pleasing to throw more salt into their broken wound. They rather need comfort now more than ever so as to avoid most of them embarking on suicides and other self destructive paths. 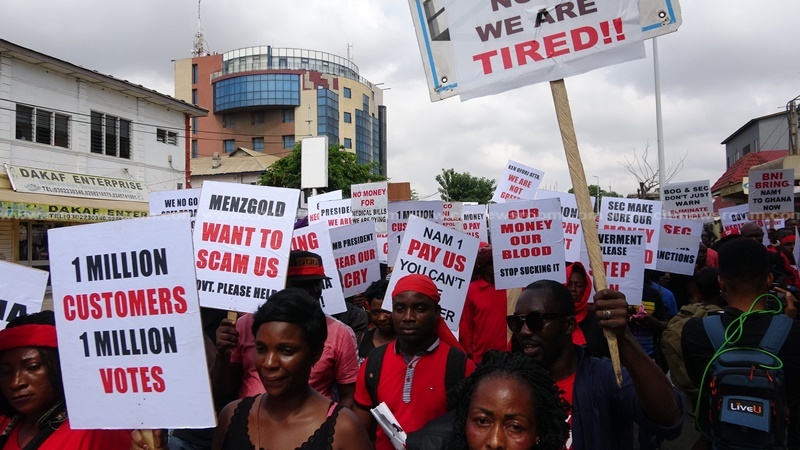 B) It has been estimated that the victims of MENZGOLD are 1.8 million, of which they have been found to cut across all the ten(10) or sixteen(16) regions of the country. It can also be assumed that each of these 1.8 million victims is of the age voting category, and also has at least 3 direct or indirect dependents, meaning the total number of people affected by this MENZGOLD saga is around (1.8 million x 3) = 5.4 million. Note; NPP won the 2016 general elections by 53.9% meaning it is likely 53.9% of these 5.4 million direct and indirect victims representing around (5.4 million x 0.539) = 2,910,600 voted for NPP. Assuming at least 1 out of every 5 of these 2,910,600 direct or indirect victims will vote against NPP in the 2020 general elections because of our unintentional victimization of them through our zeal to win this communication battle against the NDC, then it means NPP will lose at least (2,910,600/5)= 582,120 of their votes in the 2020 general elections. And this would have just been a fraction of the votes we are likely to also lose from disgruntled NPP members, disgruntled small scale and artisanal miners, some peeved unsettled God Is Love, Care For Humanity, Little Drops and other such customers, agitating contractors and people who might had lost their jobs through this needful regularization of the banking sector by BOG. Can we afford to risk this? I have taken time to read the statement by the information minister on same issue, and I find his statement very great and perfect. He was so on point so I will in all humility employ all NPP members eager to defend the party and government on this issue to carefully study its content and use it as such. Further more, I will applaud the President Nana Addo Dankwa Akuffo-Addo led government for all its efforts so far that has helped minimize the would have been impact on Ghanaians if it hadn’t taken steps to check the illegal activities of MENZGOLD now, plus its current steps being taken to help retrieve all the funds of the victims from Nana Appiah Mensah (NAM 1), the CEO of MENZGOLD. I will also suggest that this government should get all the heads of the respective regulators under former President John Mahama who failed to do their job properly, but rather watched on for the illegal operations at MENZGOLD to flourish, look credible and gain legitimacy through media hypes and huge personality endorsements, and through that enticed lots to invest there, to be immediately arrested and prosecuted. I will also admonish Nana Appiah Mensah (NAM 1) to take up the mantle as a man to do all his possible best to help get all its victims their funds so as to prevent a wash away of all the good things he has done for Ghana and its economy, plus the credibility he has strongly built in the minds of most Ghanaians about him. He should never do anything bad to disappoint all such followers of his. The only life lesson I have learnt in this whole issue is; trust no one, not even people you offer support to, and this has been evidenced from how people Nana Appiah Mensah (NAM 1) directly supported, employed and gave serious help to are now all of a sudden abandoning and rejecting him entirely now that he has found himself in trouble, they have chosen to forget everything good he did for them, so sad! I am a huge advocate against lawlessness, I am one who always believes the law should always be strictly followed, so can’t side with the illegal operations of MENZGOLD, but not withstanding that, I am still a huge advocate of loyalty, gratitude and standing firm by friends, allies, masters and love ones especially in their times of trouble. This is in fact a huge lesson of life that none should forget as we walk into the future, especially the NPP Party, government and President should never forget this lesson as we walk into the 2020 general elections.